Very often mothers of newborn babies are being told that their young ones have been diagnosed with Neonatal Jaundice – but what does this mean, and what does it imply? Here is a great article taken from https://www.mediclinicinfohub.co.za to equip mothers in knowing the causes, the effects and the best treatment protocol. Jaundice is the name given to the yellowish discoloration of the skin and eyes by bilirubin that occurs in about 50 – 80% of newborn babies. Neonatal jaundice occurs in 50 – 80% of newborn babies (depending on maturity). In most cases jaundice in newborns is due to an exaggerated normal or physiological process, is not serious and disappears in two to three weeks without treatment or complications. The bilirubin level is measured by checking the total serum bilirubin level (TSB). There are many causes of neonatal jaundice and it is the cause rather than the jaundice itself that is of importance. One of the most serious causes of neonatal jaundice is excessive breakdown of the red blood cells as in haemolytic disease of the newborn, due to a blood group (Rhesus or Rh) incompatibility between the mother and baby. Treatment of neonatal jaundice is usually by phototherapy with special lights that cause the bilirubin to become water-soluble and to be excreted in the urine. Breast milk jaundice is NOT a reason to stop breastfeeding. Jaundice is the name given to the yellowish discoloration of the skin and eyes by bilirubin that occurs in about 50 – 80 % of newborn babies (depending whether term or preterm respectively). It usually only lasts for about 10 to 14 days and no treatment is required. Most of the cases are not serious and are basically due to immature liver function. Some are the result of disease causing excess breakdown (haemolysis) of the baby’s red blood cells such as “haemolytic disease of the newborn”. Another, fortunately rare, reason is hepatitis caused by either a viral or bacterial infection. It is also known as hyperbilirubinaemia. It is not so much the jaundice but rather the reason for the jaundice that is important. Normally red blood cells survive in the circulation for about 120 days before they are removed and broken down by the body. The haemoglobin released is converted to bilirubin and carried to the liver where it is further processed and excreted in the bile. In the uterus the baby has a large number of extra red cells to help transport oxygen from the placenta to the baby. After birth, when babies start to breathe and use their lungs, these extra cells are no longer needed and are broken down. This means that the newborn baby will in fact have a relatively increased load of bilirubin to clear. Normally, the liver can cope with this bilirubin load. If the load becomes too great, or the processes within the liver slow down, or there is some obstruction to the outflow of the bile from the liver, then bilirubin will accumulate in the blood. Eventually it will reach a level where it is deposited in the skin where it will cause the yellow colour. Some of the bilirubin in the bile in the intestine is normally re-absorbed. If there is a significant delay in the passage of stools then a greater amount of bilirubin will enter the circulation and add to bilirubin levels. During pregnancy while the baby is developing in the uterus the liver is assisted in its functions by the placenta, including the processing of the bilirubin. At birth the baby’s liver has to take over on its own and suddenly has to cope with the bilirubin. It normally takes a few days before the liver is fully functional. If it takes a longer period then the bilirubin levels can become high enough to deposit out in the skin to give the yellowish colour of jaundice. Preterm babies are understandably more prone to this problem. This form of neonatal jaundice is referred to as “physiological jaundice” because it is essentially a prolongation of a normal process. Breast milk or breastfeeding jaundice is so called because the breast milk of some mothers appears to contain factors that cause jaundice. This kind of jaundice is not harmful to the infant and is NOT a reason to stop breastfeeding. More serious forms of jaundice are referred to as “pathological jaundice”. One very important cause is excessive breakdown of the red cells and is known as haemolytic disease of the newborn. This occurs when there is a difference (incompatibility) between the mother and her baby’s blood groups. The most important of these causes is Rh incompatibility. The Rhesus (Rh) factor is one of the major blood group markers. In this disease the mother is Rh negative but her baby is Rh positive. The mother becomes sensitised and produces antibodies that cross through the placenta and destroy the red blood cells of the baby. The degree of haemolysis that occurs depends on the stage of the pregnancy and the amount of antibodies that cross the placenta. The liver is overwhelmed by the amount of bilirubin produced and the baby becomes jaundiced. The destruction of large numbers of red blood cells means that the baby also becomes anaemic, which adds to the problem. This rarely happens with the first pregnancy as it usually requires two or three incompatible pregnancies for the mother to become sensitised. If the mother’s Rh factor is known after her first pregnancy she can be given anti-D (Rh) immuno-globulin immediately after delivery to try and prevent sensitisation whenever she carries a Rh positive baby. A second situation where there may be incompatibility between mother and baby is with the major blood groups – the ABO factors. This also leads to breakdown of the red blood cells but is usually not as severe as Rh incompatibility. There are many other rarer causes of haemolysis. One of them is when there is a deficiency of an enzyme needed for the integrity of the red blood cells. This enzyme is known as glucose-6-phosphate dehydrogenase (G-6-PD). If the baby has an infection resulting in hepatitis then jaundice may appear. This happens because the inflamed liver cells are not able to process the bilirubin as efficiently as usual. They also swell up and tend to block the very small ducts in the liver that carry the processed bilirubin away to the larger bile ducts. The bilirubin accumulates and eventually leaks back into the blood stream. It is this obstructed bilirubin that accounts for most of the jaundice and hence the name “obstructive jaundice”. In very rare instances a child may be born without functioning bile ducts. All the bilirubin processed by the liver can only escape by leaking back into the blood. This condition is known as biliary atresia and children with biliary atresia have severe obstructive jaundice. The signs and symptoms will depend largely on the cause. In the physiological group, jaundice is only noted on the second or third day. The baby feeds well, behaves normally and there is no enlargement of the liver or spleen. The urine may be dark but the stools are a normal colour. The bilirubin levels are not significantly raised, usually below 275 ìmol/l. This form of jaundice resolves over two to three weeks. Breast milk jaundice becomes apparent after a few days; the bilirubin rarely exceeds 275 ìmol/l but it is a cause of prolonged jaundice; the baby remains completely well and continues to thrive. It is not a reason to stop breastfeeding. In the pathological group the jaundice occurs within the first 24 hours after birth. The baby may even be jaundiced at birth. The baby may be unwell on examination, have an enlarged liver or spleen, have a rash, have pale stools or be pale. The bilirubin level can be very high, usually more than 275 ìmol/l in haemolytic disease. Jaundice lasting more than two weeks is considered to be prolonged jaundice and requires further investigation. The majority of jaundiced babies will be managed simply by screening for the total serum bilirubin (TSB). A sample of the baby’s blood is spun down and the colour of the serum is measured in a machine – the darker the serum, the higher the bilirubin level. Most delivery units will be able to do this screen. The TSB can be checked daily or more frequently if the baby is receiving phototherapy until it shows a downward trend. It may have to be checked three-hourly if one is monitoring haemolytic jaundice. In some cases it will be necessary to have the exact levels measured by a laboratory and to distinguish between the bilirubin that has been processed by the liver (conjugated bilirubin) and that which is still to be processed (unconjugated bilirubin). In physiological as well as haemolytic jaundice the unconjugated fraction is much greater than the conjugated, whereas in hepatitis the conjugated is higher (obstructive jaundice). The two fractions added together are the total serum bilirubin or TSB. Other common tests that may be done are the mother’s blood group and screening for syphilis (an important cause of neonatal jaundice) and the baby’s blood group. In some places a screen for hypothyroidism (also a cause of prolonged jaundice) is done. Further tests that may be considered if pathological neonatal jaundice is suspected are: checking the baby’s blood for anaemia, a Coomb’s test (screening for antibodies that may be causing haemolysis), assaying for G-6-PD, liver function tests or a screening for important possible neonatal infections (screening the baby for common congenitally acquired infections). Most cases will not require any treatment because the bilirubin levels are usually below 275 ìmol/l and return to normal within two to three weeks. Ensuring that the baby feeds early and regularly will stimulate the intestine so that the re-absorption of the bile is minimised. 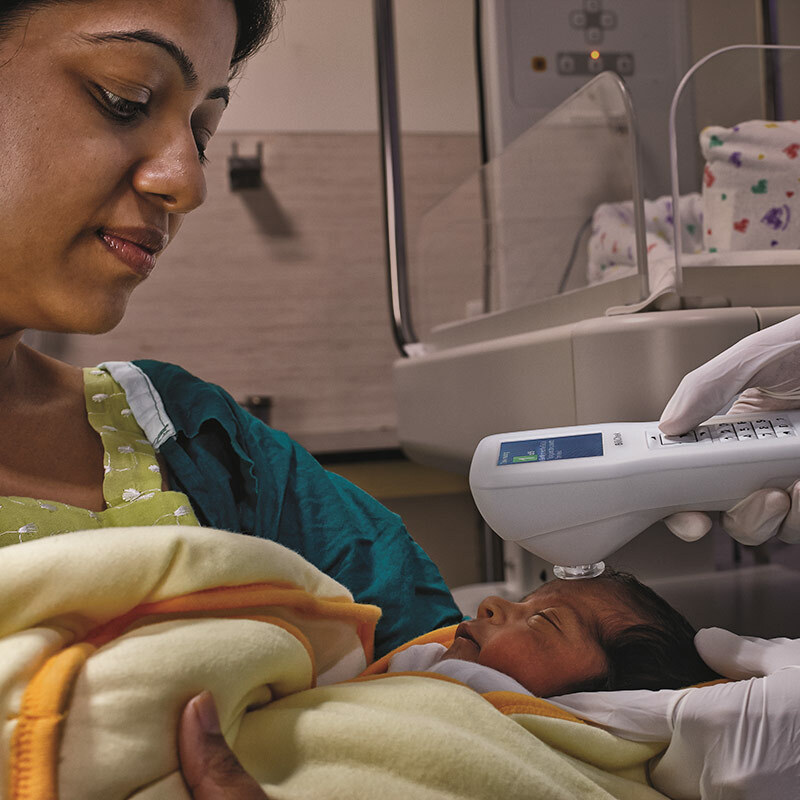 Neonatal jaundice is treated by means of phototherapy. When unconjugated bilirubin is subjected to specific fluorescent light-waves its structure is changed and it becomes water-soluble. This means that the excess can also be cleared in the urine. Whilst undergoing phototherapy the baby’s eyes must be protected against light. The baby must be fed regularly to keep up a good urine output and to prevent dehydration. The baby may have loose stools whilst undergoing phototherapy and may also become “tanned”. Charts have been devised (one for term and one for preterm babies) to assist health professionals as to how and when to intervene in the management. The course of action depends on the baby’s age and the bilirubin level. In severe haemolytic disease, if the unconjugated levels rise to above350 ìmol/l, it may be necessary to do an exchange transfusion. Here an attempt is made to remove the baby’s own blood, the bilirubin, and the antibodies causing the haemolysis, and to replace with donor blood. An exchange transfusion may be performed in other circumstances where the unconjugated bilirubin is excessively raised or there is severe anaemia. This is not a simple procedure. Not just the TSB level but many other factors have to be considered such as the cause of the jaundice, the age of the baby, whether the baby has other problems and so on before embarking on an exchange transfusion. In by far the majority of babies there are no complications associated with neonatal jaundice. The problem with unconjugated bilirubin is that if the levels are very high, especially when caused by haemolytic disease, it can penetrate into the brain and cause brain damage. This is known as “kernicterus”. It is rare because all at-risk babies are treated early with phototherapy and, in the unlikely event of that not reducing the TSB adequately, with an exchange transfusion. Anaemia can be a problem in some babies following haemolytic jaundice and they may need one or two blood transfusions in the next few months until all the antibodies have been cleared. The majority of cases cannot be prevented as they fall into the physiological group. As far as pathological causes are concerned, the introduction of anti-D (Rh) immuno-globulin has seen a significant decline in haemolytic disease due to Rh incompatibilty. The total serum bilirubin test also known as the ‘TSB’ is a simple and safe investigation to perform on any newborn baby who is becoming jaundiced. Healthcare Technologies are proud suppliers of jaundice management devices to ensure neonatal jaundice is best diagnosed and treated in hospitals.